UnREAL, You’re the Worst, Mr. Robot. If you live with mental illness, a show like You’re the Worst is downright revelatory. During its first season, the FXX comedy introduced Edgar, a military veteran with post-traumatic stress disorder. In its second season, the show revealed that its lead female character, Gretchen, has clinical depression. And in its third season, which premiered last week, Gretchen actively seeks treatment and begins seeing a therapist. In a television landscape that often misunderstands and misrepresents mental illness, You’re the Worst isn’t alone. Thanks to shows like BoJack Horseman, Lady Dynamite, and Crazy Ex-Girlfriend, it’s now easier than ever to find moving portraits of mental illness on television — but on the whole, most shows still struggle with flawed, careless, and inaccurate depictions. Ahead, we break down the most ingrained tropes about mental illness. The second season of UnREAL has been derided for many reasons — its poor handling of police brutality, its inconsistent characterization, its nonsensical arcs — but the show’s terrible depictions of mental illness are rarely discussed. Over the course of two seasons, UnREAL has made the mental health of its protagonist, Rachel Goldberg, a crucial element of its narrative, but refuses to give her a clear diagnosis. By failing to offer a diagnosis, a show’s writers can cherry-pick a variety of symptoms, which ultimately creates a dishonest portrayal that hinges on plot needs. This often leads to confused characterization, or worse, an exploitative view of mental illness. And UnREAL isn’t alone: Many shows that deal with mental illness tend to avoid outright diagnoses, from Bones to Mr. Robot. This doesn’t preclude a show from being great, of course, but the lack of a clear diagnosis is a big reason why so many portrayals of mental illness are extreme and over the top. Audiences don’t need a play-by-play of the textbook issues associated with mental disorders, but there are certainly ways to embrace accuracy while also creating great story lines, as You’re the Worst and Jessica Jones readily prove. If you’ve ever dealt with a psychotic episode or intense dive into mania, you know that that mental illness isn’t a prerequisite for creative genius. Nevertheless, the image of the mad genius or the suffering artist is an attractive one to storytellers, as seen by the wave of “difficult man” shows like House, which dominated the early 2000s until the trend reached the level of parody with Rainn Wilson’s short-lived Backstrom. 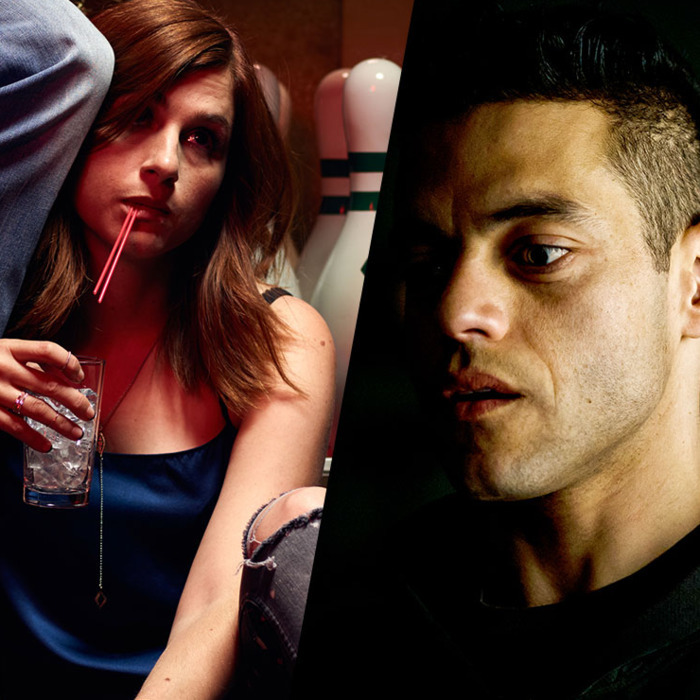 For the most part, though, this mad-genius phenomenon seems to be highly gendered, with Mr. Robot’s Elliot Alderson, Sherlock’s Sherlock Holmes, and Breaking Bad’s Walter White being just a few examples. In the wake of oft-criticized studies that claim a link between creative work and mental illness, pop culture can tend toward romanticizing the artist’s struggle, which creates an inaccurate portrait of debilitating disorders. Out of all the tropes on this list, this is the most dangerous. Treatment varies from person to person, of course, but the idea that medication robs you of your personality is odious. Contrary to what’s often shown on TV, psychiatrists and mental-health professionals aren’t manipulative villains or incompetent caregivers. These claims contribute to the fear that prevents people from finding the right treatment. In recent decades, TV shows like Monk, Pretty Little Liars, Ally McBeal, Star Trek: The Next Generation, and Buffy the Vampire Slayer have all contributed to this trend. Which show encapsulated it most recently? Once again, it’s UnREAL. At the midpoint of the second season, Rachel has an intense manic episode, then turns to her psychiatrist mother, Olive, who promptly has her committed and doped up within an inch of her life. To make matters worse, we learn that Rachel was raped at age 12 by one of her mother’s patients. But instead of giving a damn about her daughter, Olive blames Rachel, takes control of her psychiatric care, and pumps her with drugs. As if that wasn’t bad enough, Rachel’s mentor, Quinn, repeatedly speaks out against the value of medication, claiming that Rachel is fine. When shows indulge such dangerous misconceptions, they’re only adding to a tone-deaf culture that discourages people from seeking help. Although the rise of shows with honest depictions of mental illness is great, it also highlights a broader issue: the lack of diversity with regards to who experiences those illnesses (Edgar on YTW and Elliot on Mr. Robot being two recent exceptions). When people of color are actually incorporated into mental-illness story lines, they tend to play therapists, as demonstrated on UnREAL, Mr. Robot, and You’re the Worst. If anything, TV has predominantly favored white women when telling these stories, as we see with shows like Lady Dynamite, Jessica Jones, and Crazy Ex-Girlfriend. It’s worth noting that mental illness is treated as a hidden shame in many communities of color. It’s never discussed, let alone regarded with any empathy. This creates a dangerous culture of silence where people either have no access to treatment, or feel unable to seek it. Given the stunning rates of attempted suicide among people of color, the absence of diverse stories about mental illness is all the more damning. Television isn’t required to be a dry public service, minutely extolling the details of different disorders and what it means to live with them. But having more inclusive portrayals of mental illness on TV would go a long way to fight stigmatization. Mental illness is a catch-all term meant to describe a slew of very different disorders. But if you watch enough TV, you’ll notice that characters predominantly experience depression, anxiety, and a bit less often, bipolar disorder — all of which can be found in shows like BoJack Horseman, You’re the Worst, Buffy the Vampire Slayer, Being Mary Jane, Crazy Ex-Girlfriend, and Empire. When schizophrenia, dissociative identity disorder, antisocial personality disorder, and other disorders are portrayed in films and TV shows — such as Fight Club, Hannibal, The Machinist, and far too many episodes of Law and Order to count — they tend to eschew the perspective of the character dealing with mental illness, and instead focus on the characters who are affected by their issues. The few exceptions tend to involve idiosyncratic serial killers (Hannibal) or grotesquely destructive characters (Elliot on Mr. Robot). When films and TV shows do introduce diagnoses beyond depression, it’s often as a tactic to define characters through danger and violence. There’s the aforementioned Hannibal, a series as beautiful as it was grossly inaccurate in these matters. The same trope bubbles up in The United States of Tara, Girl Interrupted, and every Batman adaptation. Even Scandal fell prey to it last season, when Olivia Pope’s undiagnosed PTSD led her to murder the man who kidnapped her. A show like You’re the Worst strikes a nerve because it offers something truly rare: depictions of mental illness that acknowledge a character’s humanity without romanticizing their disorder. The success of David Fincher’s Seven and Fight Club sparked a noticeable rise in TV shows about mentally ill criminals. These characters, who are almost exclusively men, populate psychological thrillers like Hannibal, Mr. Robot, and Dexter, all of which perpetuate the stereotype that people with mental illnesses are fearsome criminals, if not outright violent ones. In fact, people with mental illness are much more likely to be victims of violent crime. In a bizarre way, mental illness has become an excuse for characters’ wrongdoing, rather than a part of their identities. You see this a lot in a general sense when it comes to male characters who are great at their work, but terrible people: Don Draper on Mad Men, Dr. Gregory House on House, Dexter on Dexter, and pretty much any “difficult man” who anchored a Golden Age drama. But for female characters, the link is a bit more direct. It has been interesting to see how the rise of complicated female characters in shows like UnREAL, The Girlfriend Experience, and Girls has coincided with a rise of female characters living with mental illness. It’s almost as if a woman can’t transgress certain social norms without her actions and identity being pathologized. The best (or worst?) example of this is … yep, you guessed it: UnREAL. The show is like a greatest hits of what TV gets wrong about mental illness. Whenever Rachel messes up — which is quite often — her toxic relationship with her mother and her mental issues are usually trotted out as an excuse for her mistake. All of this isn’t to say these tropes can’t be used to create meaningful television, or that showrunners have to treat mental illness as some after-school special in order to educate their audiences and be 100 percent truthful. But when a show handles such heavy subject matter, its creators should demonstrate a respectful understanding of the issues they’re raising. As You’re the Worst has shown, there are plenty of ways to balance engaging characterization, honest depictions of mental illness, and evocative storytelling.